Codes, codes: a system built on codes. The numbers used in the health-care marketplace to identify procedures and items go by many names. One of the most common is the HCPCS code, for Healthcare Common Procedure Coding System. It’s the system used by the Centers for Medicare and Medicaid Services. Are your eyes glazed over yet? I’m not surprised. The codes are often five digits — 77057 is a screening mammogram, for example — but sometimes they are an alphanumeric; G0202 is a digital screening mammogram. The codes will often appear on a bill from a provider next to the procedure or item; they also often appear on the explanation of benefits from an insurance company. If you need to question a bill, you might look up the code to see if the actual procedure or item was one that was part of your visit. There are about 7,800 codes, so mistakes are common. The HCPCS coding system is used by the government to establish the rates it will pay for Medicare services, the closest thing to a fixed price in this marketplace. Here’s the government’s complicated “physician fee schedule” lookup, which begins with terms of service for something called the CPT code. One complicated thing about the HCPCS coding system is that it’s built using the Common Procedural Terminology coding system, which was invented by, and is maintained by, the American Medical Association. It is copyrighted, and licensed for use only to paying customers. Every time you encounter a CPT code lookup tool online, odds are you will be asked to accept terms of service. The AMA earns a lot of money from using this lookup tool. The CPT categories are generally broken down into anesthesia, for example, surgery, radiology and so on. If you’re curious about what the code stands for, you can use the CPT code finder on the AMA site. The codes are incredibly confusing, with a standard office visit to a doctor attaining a different code based on the number of symptoms the patient has, the age of the patient, the amount of time the doctor spends with the patient, and so on. It’s actually mind-boggling. They’re also not in real English: US means ultrasound, or sonogram, for example. That makes the coding system even harder for normal people to negotiate. That’s why there’s a whole industry built around coding. Whole online communities where people gather to question coding practices and share expertise. There’s even a discipline called “upcoding,” which describes the practice of making sure that the maximum amount of goods and services are included on a bill. Oh, and if that’s not enough about codes: There’s also the ICD-9, the International Classification of Diseases, maintained in the United States by the Centers for Disease Control, and internationally by the World Health Organization. They describe diagnoses, as opposed to the HCPCS, which describes procedures. There’s a big storm brewing over the switch from the ICD-9 to the more complicated ICD-10, as Anna Wilde Mathews details in this fabulous Wall Street Journal article. Walk into a lamppost, or get bitten by a macaw? There’s an ICD-10 code for you. Also, there are DRG codes, for diagnosis-related groups. 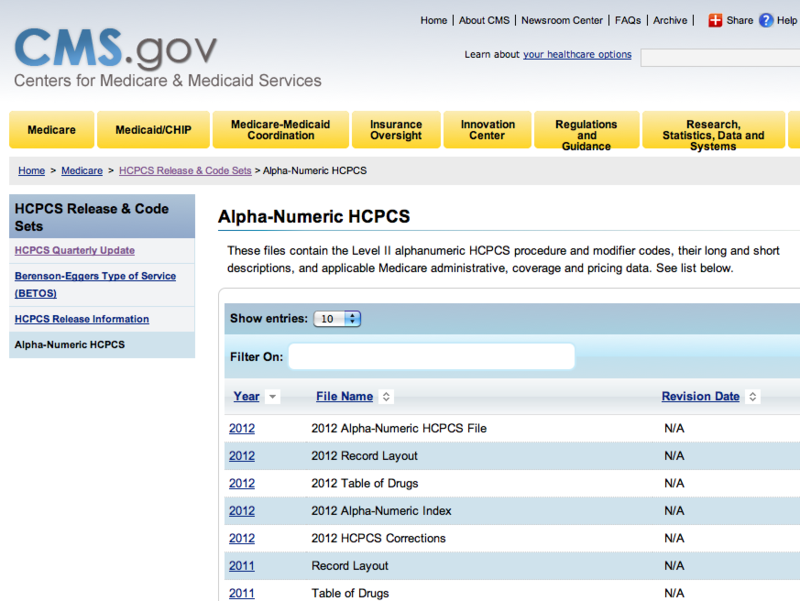 These codes, too, are not specifically about procedures, as the HCPCS codes are; rather, the DRG’s are used by Medicare to group hospital services based on a diagnosis, type of treatment, and other criteria, the assumption being that a similar diagnoses should bring similar treatments, giving another guideline to how care is delivered to patients. Confused? Sorry. It’s a confusing marketplace. Be glad we didn’t drag you into the conversation about RVU’s, the relative value units used by Medicare to determine prices.